Max. 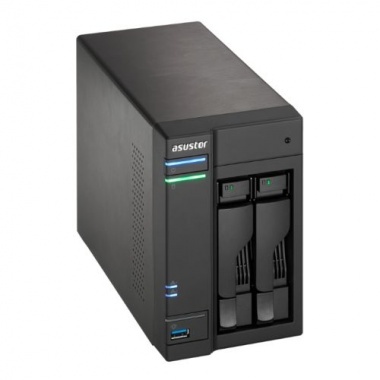 Capacity: "20 TB (10 TB x 2, Capacity may vary by RAID types)"
Support for Online RAID Level Migration"
AS61 series devices are powered by IntelCeleron Braswell dual-core processors, equipped with 2GB of dual-channel memory, and feature read speeds of over 224.23 MB/s and write speeds of over 213.41 MB/s under RAID 1 configurations. The AS61/AS62 models are the first NAS devices in the world to support dual-channel memory, be able to smoothly playback 4K video and be powered by the latest Intel Celeron Braswell processors. Furthermore, AS61/62 series devices are not only energy efficient, but offer a combination of performance and price that is unmatched in its class. Get ready to enjoy brilliant ultra high-definition 4K video from the comfort of your own home! Focusing on enterprise-class file encryption needs, ASUSTOR has launched the AS6102T series models with built-in hardware encryption engines, allowing data to be completely protected from the moment it is first stored on the NAS. This means that you never have to worry about your confidential data falling into the wrong hands even if your hard disks become lost or stolen. The built-in AES-NI hardware encryption engine also provides read speeds of over 178.39 MB/s and write speeds of over 106.16 MB/s for encrypted data*. A professional grade NAS needs to be equipped with a diverse array of expansion functionality. ASUSTOR has built in USB 3.0, USB 2.0, eSATA, gigabit Ethernet and HDMI 1.4b ports along with a high fidelity audio S/PDIF port, allowing the NAS to connect to different types of external devices and not be limited to its internal capacity. ASUSTOR NAS redefines the meaning of flexibility and expandability in network storage. Depending on your usage preferences, you can decide whether or not you want to upgrade memory. AS61/62 devices provide users with the ability to flexibly upgrade memory so there is no need to worry about the memory before you purchasing the device. When upgrading memory, you simply need to remove the cover of the NAS to do it (There are 2 expansion memory slots in total. Memory can be expanded up to a maximum of 8GB. ), letting you easily improve system performance and allowing your NAS to simultaneously run more Apps. Turn your NAS into your digital music hub and let ASUSTOR's 61/62 Series devices take your local audio playback to another level. You can use SoundsGood or iTunes Server to play high quality digital music from your NAS and further combine it with S/PDIF high fidelity optical output for an unmatched listening experience that will truly bring your music to life. At Proactive IT Support we offer a range of computer repair services, including virus removal, business network maintenance, repairs to networks, system sales and IT Support for companies of all sizes. With over 18 years’ experience, we’re also one of the most tried and trusted organisations in the region.
" First I had my laptop screen replaced earlier in the year. Then I had my PC upgraded to Windows 10 and a faster hard drive installed. Both times I had a top notch professional service at very reasonable prices. I always recommend them to my family and friends ." "I had a small query it was handled promptly and sorted. I did not feel as if I was a pain which I have felt with other tech companies." " I can't praise them enough, first class service, excellent knowledge and friendly...they retrieved all my data when my pc crashed, came on call out at a drop of a hat when I encountered a hitch. Nothing was too much trouble...I couldn't have asked for more - thank you." "A very helpful, capable and friendly team who won't stop until they get your problem sorted. Great service, I highly recommend them." "Great quick service. Great service as always."